The way I get around the first challenge – what words to teach – is to have the students create their own lists of words they’ve encountered more than once but still don’t know. This semester, to make that process easier and give me material to use to teach the words, I made a list of all the words in two cartoon vocabulary books: Picture These SAT Words by Philip and Susan Geer and Vocabbusters GRE: Make Vocabulary Fun by Dusti and Deanne Howell. I chose those two books because I wanted to help students learn how to create images to go along with new words. I’ll write about that effort in a follow-up post. Their new word list each week included the word, common definitions, synonyms, some kind of image, and at least three context examples. Context examples are crucial for teaching students how we actually use the words – I will write on that too in a follow-up post. 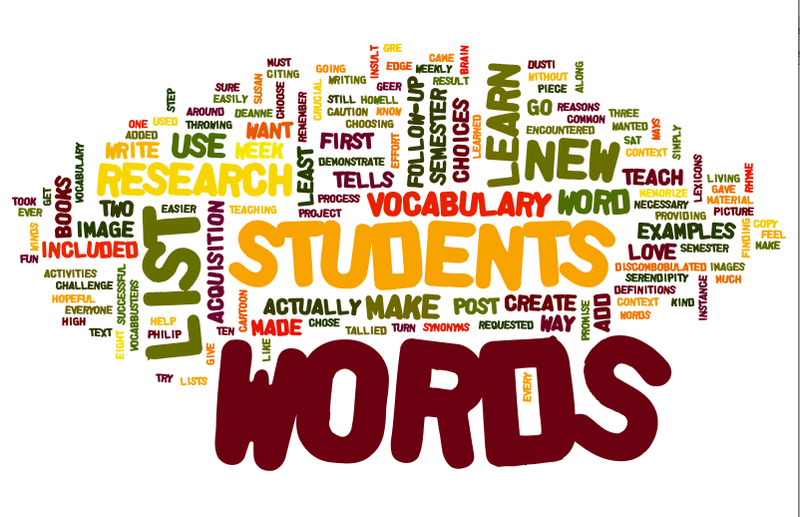 I have learned that choosing words that students actually want to learn is the first step in a successful vocabulary acquisition project. As a result, some students go out of their way to demonstrate their new words in every piece of writing they turn in. I do love them when they do that, and finding reasons and ways to love my students is what it is all about.